I love Pancake Day.. Apart from my birthday, I really think it is my favourite day of the year. 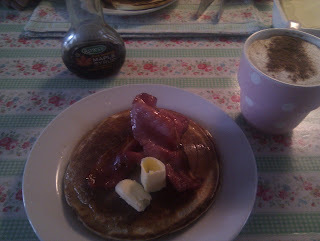 Of course, I have pancakes on my birthday for breakfast but on Pancake Day, you are allowed them for dinner. At least, that's what I do. 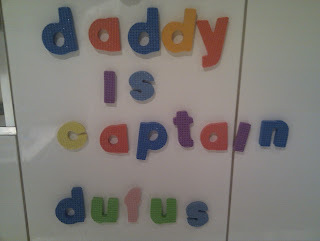 Every year, the Chardmeister askes me if I'm really having pancakes for dinner and I look at him like the Captain Dufus he is and say, 'well, what else would I be haiving?' Really. This Pancake Day, I'm even having proper Canadian maple syrup brought back by my good friend and writing buddy, Liah. It's in a maple leaf shaped bottle. Get me. Also, the stack of pancakes I have tonight will be much taller than the stack in the photo above - it is dinner, after all. Having worked on polishing Rock-A-Lillie this afternoon and giving myself a headache in the process, a pancake dinner is just what I need. It'll be back to the edit after dinner - I want to be happy that all the reworked chapters make sense and read in line with the rest of the book. I've changed the entire beginning on the advice of the RNA NWS reader (which does work much better), and now need to make sure there are no continuity issues later on. Plus, I recently cut a minor character, so I need to make sure she doesn't appear anywhere in the narrative! Once I have checked it all makes sense, it will be gone off into the hands of two carefully selected agents. Eek! By the way, if you don't know what the RNA NWS is and you're an aspiring romance writer, then you should! Every year, the Romantic Novelists' Association run a New Writers' Scheme, more of which you can find out about here. It runs from January each year and only accepts 250 people - it's already full for this year but I can highly recommend it for next year if you aren't one of the 250. For a very reasonable fee, you will get membership to the RNA for a year plus a full critique of an unpublished MS by a published author in your genre. If the reader thinks your MS is potentially good enough for publication, it will go to a second reader who may decide to forward it to an agent. Wowsers! My critique was incredibly in depth, insightful and phenomenally useful (as well as being really encouraging). I didn't make it to a second reading but my reader did say with a couple of changes (quite large ones to be fair), it would be submission ready. That's not to say I would be submission ready though! Anyway, it's time for pancake making... Happy Pancake Day everyone! !